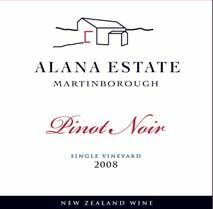 Alana Estate is not a familiar name to American Pinot Noir geeks, but this estate will shortly be exporting their excellent Pinot Noir to the United States, and I am confident this wine will find a place in many of their cellars. Alana Estate was established in 1992 by a group of shareholders headed by Ian and Alana Smart. Encompassing 55 acres of land, 42 acres of which are in planted vines, and located on the northern edge of the Martinborough Terrace, this estate is believed to be the driest location in Martinborough. The site is cool with well-drained deep stony soil making growing conditions ideal for Pinot Noir, Chardonnay, Riesling and Sauvignon Blanc. Recent plantings are dominated by close density and low trellised Pinot Noir. The vineyard will be in full production in 2010. Alana’s most immediate neighbor is the world-renowned Dry River, which occupies 30 acres of land immediately adjacent the Alana Estate. Ata Rangi and Martinborough Vineyards are close by. Alana Estate Pinot Noir will be available in the United States November 1, 2009. A portion of the United States allocation is being made available first to the mailing list through the U.S.-based website, www.alanestate.com, that will launch October 1, 2009. Some wine will be sold through a select number of fine wine stores and restaurants, primarily in CA, AZ, NV, MI, TX, and NY.